Tarek Chemaly: Never mind the Balenciaga, Ikea just issued a guide on how to spot fake Frakta bags! 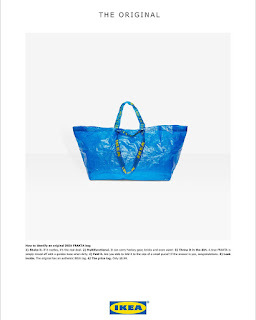 Never mind the Balenciaga, Ikea just issued a guide on how to spot fake Frakta bags! There you go, it is not the super expensive Balenciaga take on the Ikea Frakta that needs authentication, but rather the latter! Above is how to indeed spot a Frakta, lest it be mistaken for its Balenciaga bag. No it is not made of leather, no it does not cost an obnoxious sum of money, no it does not have a golden logo on the inside, and no it is not designed by Demna Gvasalia. The rest you can read above! This is the work of Swedish agency Acne.